Where compressed air escapes, friction develops between the gas molecules and the pipe wall. This friction produces a high frequency ultrasound inaudible to the human ear. 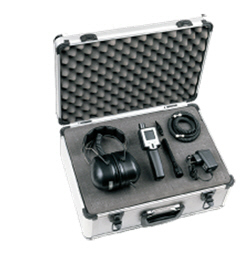 The METPOINT LEAK DETECTOR registers the ultrasound, transforms it into an audible sound and indicates it optically. In this respect, only those frequencies are registered which will occur in the case of leakage. Thus, the precise location of the leak is easily identified even where industrial noise is present. Using the METPOINT LKD, the detection of compressed air losses at micro cracks, worn-out flange joints, defective sealing rings or loosened connections no longer presents a problem. Sensitivity Location distance up to 50 ft.